Exhibition Run, Grosse Pointe, MI, 1903. Henry Ford driving the “999” in an Exhibition Run against Harry Harkness in a Mercedes Simplex, at the Detroit Driving Club’s 1 Mile Track in Grosse Pointe. Henry Ford was actively involved in auto racing from 1901 to 1913. His motive for entering the 1901 race against Alexander Winton, was to promote his name and reputation, as a means of attracting investors for a new auto manufacturing company. For a time he also was in it to make money, and after Ford Motor Company was founded in 1903, he used racing successes to advertise the attributes of his production vehicles. On November 30, 1901, less than two months after he won the race against Winton, Henry Ford and several partners founded the Henry Ford Company. However, there was friction between Ford and his partners almost from the beginning. For one thing, Ford was dissatisfied with his share of the company, and he wanted to continue racing, while his associates wanted him to focus on their production car development. 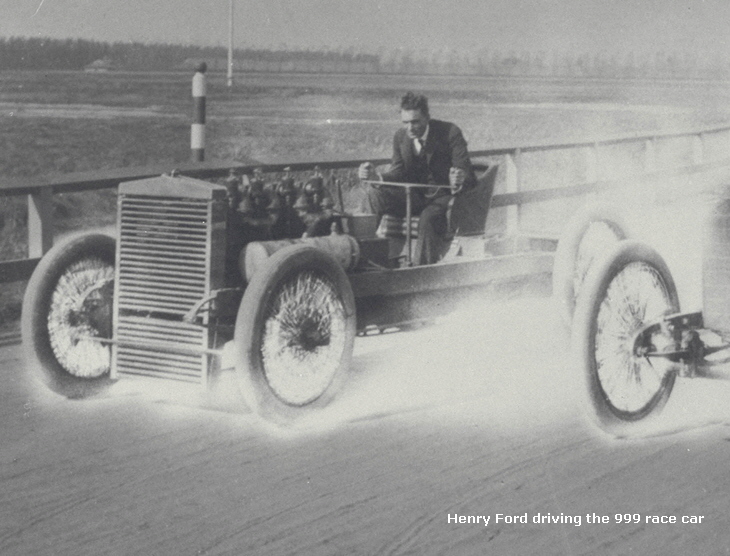 The result was that Ford left the Henry Ford Company in March, 1902, with a $900 settlement and plans for a race car. Another factor in Ford’s decision to leave the Henry Ford Company was the other stockholders’ decision to bring in Henry M. Leland as an engineering advisor. Leland was one of the world’s preeminent machinists of the day, but at the time Ford felt unable to work with him. A few months after Ford left, in August, 1902, the name of the company was changed to the Cadillac Automobile Company. In a further historical twist, Henry Leland resigned from Cadillac in 1917 and formed the Lincoln Motor Company, which Henry Ford bought in 1922. In May, 1902, Ford and Tom Cooper, a prominent bicycle racer, along with several assistants, began building the cars named 999 (painted yellow) and Arrow (painted red, also known as the Red Devil). Originally, these cars could be differentiated by their intake manifolds (the 999 had right-angle bends in the runners, while the bends in the Arrow’s manifold were more gentle and curving, which made this car the faster of the two). However, over the time they were raced, parts and paint were swapped between the two so often that precisely which car was which became obscured. These cars had inline four-cylinder engines, displacing 1,155.3 cubic inches (7.25 in bore, 7-in. stroke), developing somewhere between 70 and 100 horsepower. The flywheel weighed 230 pounds, and was connected to the rear axle through a wooden-block clutch and a solid shaft (no universal joints), that terminated in a ring and pinion gear (no differential) to transmit power to the rear wheels. The driver steered with an iron bar that pivoted in the middle, and there was no rear suspension. Also, both the crankshaft and valve gear were exposed, so the driver not only was jolted by every ripple in the road, but also was continually sprayed by oil. Engine……………….4 cylinder , 1155.3 cid. Henry Ford and driver Barney Oldfield posing with the legendary 999 race car. Oldfield drove the car to victory in the five-mile Manufacturers’ Challenge Cup on Oct. 25, 1902, in Grosse Pointe, Michigan. Oldfield, a former bicycle racer, had never driven an automobile until a week before the race. Yet his daring driving and the 999’s massive four cylinder, 1156 cubic-inch displacement, eighty-horsepower engine combined for an easy win over the heavily-favored Alexander Winton and three other cars. 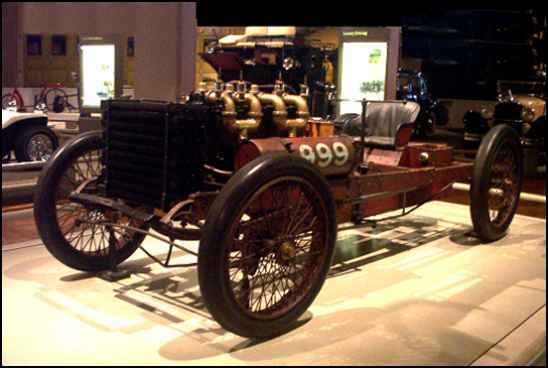 The 999’s first race was a rematch with Winton at the Grosse Pointe track on Oct. 25, 1902. This was the race that launched the career of Barney Oldfield, a champion bicycle racer who had never driven a motor vehicle of any kind prior to his first run in the 999. That was about a week before the race, a five-mile event for the “Manufacturers’ Challenge Cup.” There were four cars in the race but Winton was the primary challenger, and nobody could stay with Oldfield. He won easily with a time of five minutes, 28 seconds, which set a record for a five-mile race on a closed course. Henry Ford’s name is part of the legend of these cars, but in fact, during the time they were winning races and setting records, Ford owned no part of them. He sold his share to Tom Cooper after the first test session, which was a failure, about two weeks before the Winton race. 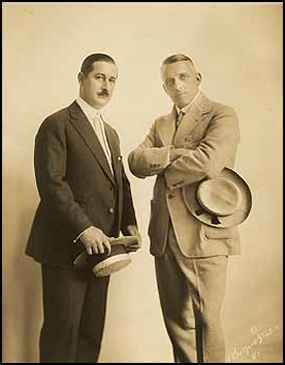 Cooper owned the cars until 1904, when he sold them to Billy Pickens, a race promoter. However, Ford seems to have enjoyed promotional rights, especially when it came to using the vehicles and advertising their successes. After the October, 1902, race, Henry Ford focused his energies on establishing the Ford Motor Company, which was incorporated on June 16, 1903. The first production car, a two-cylinder Model A, was completed at the Mack Avenue Plant on July 23. During this time, Cooper and Oldfield were touring the country with the 999 and Arrow, winning races and setting speed records. Oldfield, his fame as an auto racer firmly established, switched to Winton during that summer. In September, 1903, Ed “Spider” Huff (Ford’s riding mechanic in the 1901 race) and Frank Day drove the cars in the first race at the Wisconsin Fairgrounds. Unfortunately, Day crashed the Arrow and was killed. The wrecked car was shipped back to Detroit, where Ford rebuilt it for a land speed record run on the ice of Lake St. Clair during the winter. 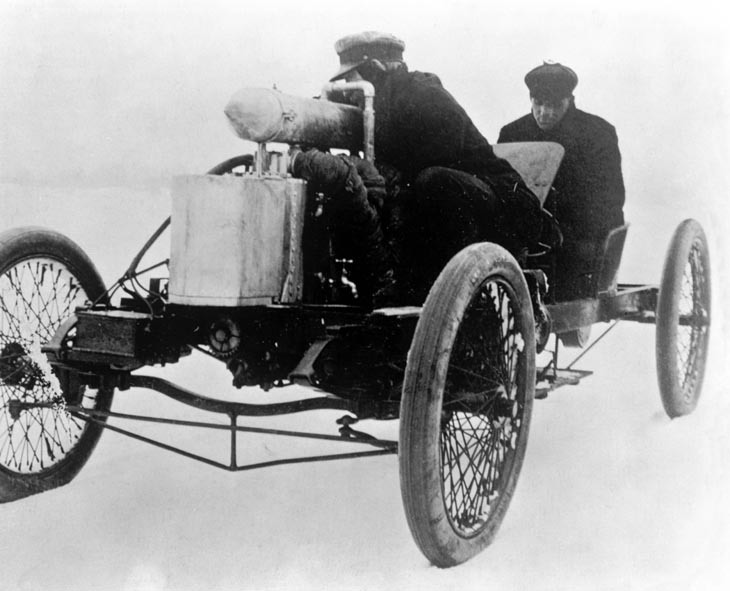 That happened on Jan. 12, 1904, when Ford and Huff set a flying-mile record — timed and sanctioned by the AAA — of 91.37 mph. By this time, the car was being referred to variously as the “new 999” or the “Red Devil 999” in newspapers and advertising. Ford’s record was broken by William K. Vanderbilt at Ormond Beach, Fla., less than a month later, but that was plenty of time to generate widespread publicity for Ford and his new company. By the summer of 1904, Ford had a new driver, Frank Kulick, who started winning races in a car powered by a pair of two-cylinder Model A engines bolted together to form a flat four. The engine produced 20 horsepower, but the car was very light — eventually down to 881 pounds. Kulick often beat much more powerful but also much heavier cars, and this was one of the first race cars to prove the advantage of a good power-to-weight ratio. 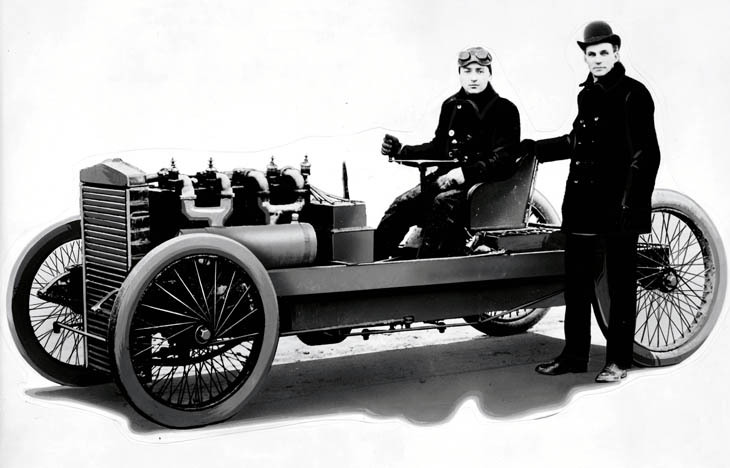 In 1905, Ford developed a six-cylinder Model K race car to make land speed record attempts; for a variety of reasons, the car was never successful. 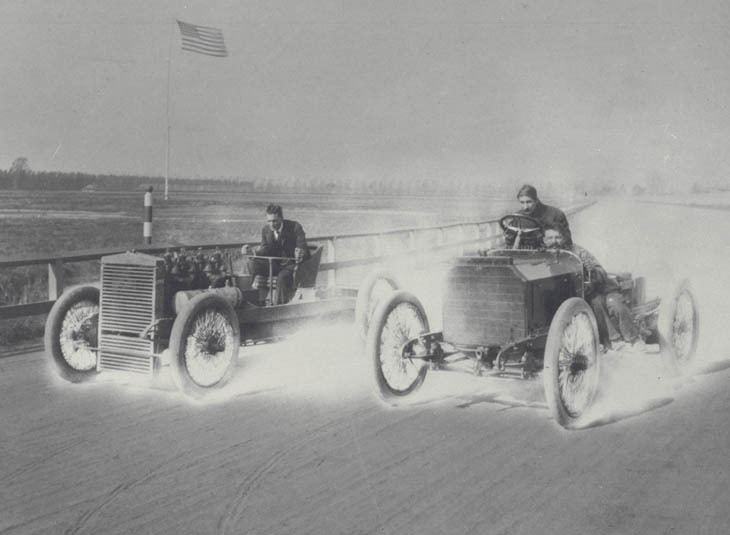 In June, 1907, however, Kulick and Bert Lorimer drove a production version of the Model K in a 24-hour race for “stock” cars on a one-mile oval at the Detroit Fairgrounds. 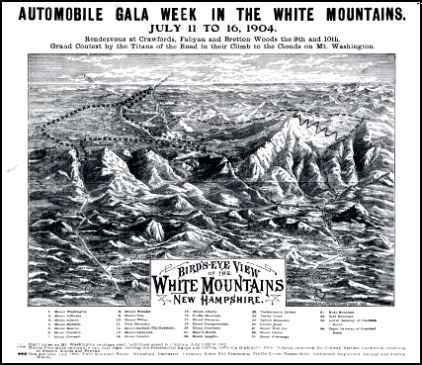 They covered 1,135 miles and won the event using two different cars, as was allowed by the rules. 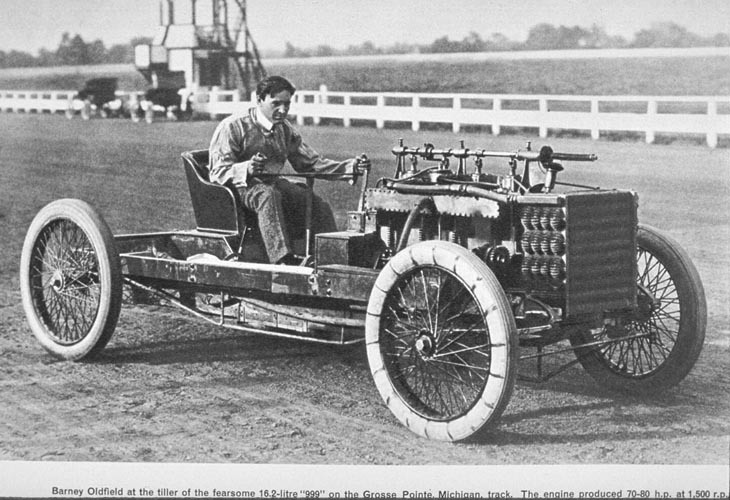 Kulick crashed the Model K race car at the Detroit Fairgrounds in Oct., 1907, and broke his leg in several places. Ford scrapped the Model K racer and declared a moratorium on building race cars that lasted until 1910. His decision to resume probably was influenced by the opening of the Indianapolis Motor Speedway in 1909. 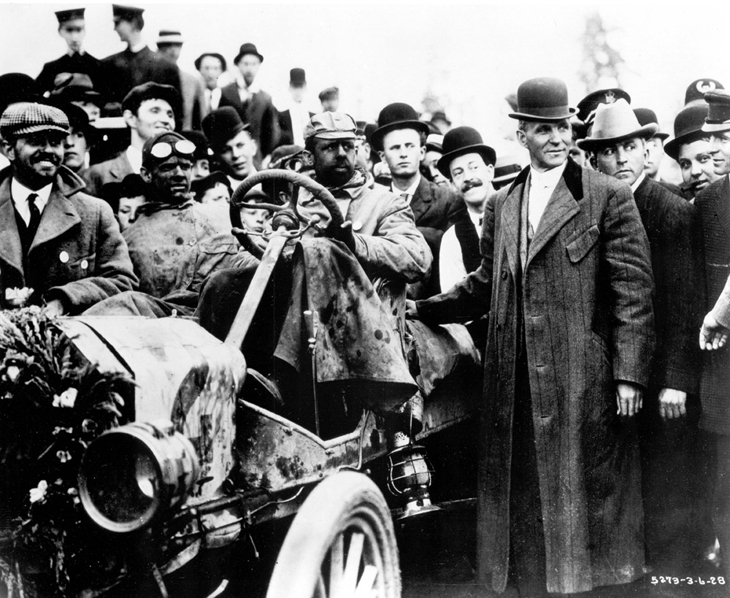 The first transcontinental car race, from New York to Seattle, was held in 1909, and Henry Ford’s Model T won. The trip took 22 days and 55 minutes at an average speed of 7.75 mph. 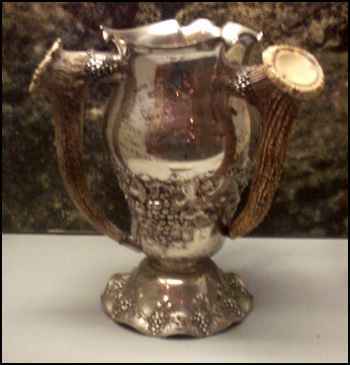 From the collections of The Henry Ford and Ford Motor Company. In the meantime, the Model T had been introduced in 1908, and less than a year later, in June, 1909, it finished first in the “ocean-to-ocean” New York-to-Seattle race, sponsored by Robert Guggenheim. Bert Scott and Jimmy Smith drove the provisional winner, but the car was disqualified because they had changed the engine (giving the win to a Shawmut). However, the several weeks that passed while the judges deliberated gave Ford ample time to reap the benefits of massive publicity and advertising. During 1910, 1911 and 1912, Frank Kulick won many races around the country in a stripped and reworked Model T, including a one-mile oval speed record at Detroit Fairgrounds in the fall of 1911, when he beat a Blitzen Benz with a time of 50 seconds flat. In 1913, Henry Ford tried to enter Kulick and the Model T record car in the Indianapolis 500. However, race officials required 1,000 pounds to be added to the car before they would accept his entry. Ford told them, “we’re building race cars, not trucks” and pulled out. Shortly after that, Ford Motor Company withdrew from auto racing altogether. Ford cited dissatisfaction with the sport’s rules and classifications, but this also was a time of extraordinary company growth, and the booming business demanded all of his attention. Business was so good that Ford didn’t need publicity from racing any more. Also, race cars at that time were dangerous and fatalities were common, which could generate negative publicity. Ford Motor Company did not embark on another “factory” racing program until the 1950s, except for the unsuccessful Miller-Ford entries in the 1935 Indianapolis 500. While the company’s direct involvement in racing may have ended for more than 20 years, the Model T and later the Ford flathead V8 ensured that, over a period of some four decades, Ford was the car and the engine of choice among grassroots racers across the country. 1901. 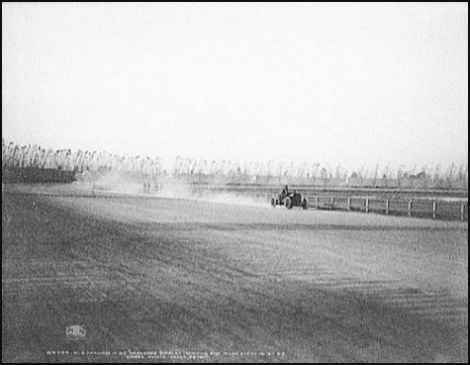 Henry Ford drives in his first and only race; defeats Alexander Winton in a 10-lap race on a one-mile oval track at the Detroit Driving Club, Grosse Pointe, Mich.
1902. Barney Oldfield drives 999 to victory in a five-mile race at Grosse Pointe for the “Manufacturers’ Challenge Cup.” Alexander Winton is primary challenger. Time is 5:28.0, a record for a five-mile race on a closed course. 1903. Ford 999, driven by Barney Oldfield, laps the Indiana Fairgrounds one-mile dirt track at 60 mph, fastest speed ever recorded on a closed circuit. 1904. In January, Henry Ford sets a one-mile land speed record – 91.37 mph – (AAA sanctioned and timed) in the rebuilt 999/Arrow on the ice on Lake St. Clair. Frank Kulick starts winning races, driving a car powered by two 2-cylinder Ford Model A engines bolted together (making a flat four). 1907. Frank Kulick and Bert Lorimer win a 24-hour race for “stock” cars on a 1-mile oval at Detroit Fairgrounds, driving a production Model K with six-cylinder, 40 hp engine. The rules allowed the substitution of cars as well as drivers, and the team used two different Model Ks to cover 1,135 miles. 1908. Ford Model T is introduced on October 1. In the next 20 years, it puts the world on wheels, and also becomes the car of choice in entry-level auto racing. Many performance aftermarket parts become available for racing modifications. 1909. Ford Model T wins New York to Seattle cross-country race. 1911. Driving a stripped and reworked Model T, Frank Kulick beats Bob Burman’s Blitzen Benz in a one-mile oval speed record run (50 sec. flat) at Detroit Fairgrounds. 1913. Henry Ford tries to enter Kulick and the Model T record car in the Indianapolis 500. His entry is refused unless 1000 pounds is added to the car. Ford tells them, “we’re building race cars, not trucks” and pulls out. Henry Ford at the wheel of the 999 race car. http://whitemountainhistory.org/Early_Movies.html Harry Harkness in 1904 first official race of one of the earliest races in the USA. See Harry coming down the hill on video minutes 1:46 – 1:54 in the famous Climb to the Clouds race he won in 1904. The Climb to the Clouds is a hill-climb up the Mount Washington Auto Road to New England’s highest peak. Drivers race against the clock, competing for the fastest time. The race is historic, dating back to July 1904. “It’s one of the oldest sports events in the entire country, if not North America,” according to event director Paul Giblin. The course is one of the most challenging hill-climbs in the country. With steep dropoffs and hairpin turns, drivers battle a number of elements on their way to the top of the road, which is a mix of dirt and asphalt. The drive is technically challenging for even the most experienced professional racers and not every competitor makes it to the top. https://www.youtube.com/watch?v=38aXXHzzyY4&feature=email CLEANED UP VERSION OF VIDEO OF LOUIS CHEVROLET WINNING THE HARKNESS TROPHY AND HAVING TROPHY PRESENTED BY HARRY HARKNESS TO LOUIS CHEVROLET AFTER WINNING. Special Presentation Commemorating the Centennial of Naval Aviation, focusing exclusively on San Diego’s contributions. On November 14, 1910 Aviation pioneer and inventor Glenn Curtiss sent a letter to Secretary of the Navy, George von Lengerke Meyer, offering to train a naval officer to fly, free of charge. By the 23rd of December, orders had been prepared and issued to thirty year old submarine officer, Theodore (Spuds) Ellyson to report to the newly formed Curtiss Aviation School on North Island. On January 17, 2011, Ellyson began his training marking the beginning of naval aviation. Based on Ellyson’s monthly reports to the Navy, a decision was soon made that aviation could play a future role in America’s maritime services. Then, on May 8, 1911, Captain Washington Irving Chambers, USN, signed a requisition for the Navy’s first airplane, the Curtiss A-1 Triad. While the Navy established some specialized test facilities in Norfolk and Anacostia, the development of Naval Aviation as a practical tool remained focused in San Diego. The fundamental changes in fleet structure from “Big Guns” to “Flat Tops”, the emergence of the aircraft carrier as the pre-imminent sea going weapon, happened mostly during the period between 1920 and 1940 in San Diego. So dedicated was the North Island Naval Air Station to that development that at one time during the thirties every aircraft carrier in the US Navy was home-ported there. Glenn Curtiss was the first to impact North Island during the early years of naval aviation. He originally became interested in San Diego while participating in the 1910 Air Meet in Los Angeles. Curtiss had been conducting his aviation experiments and flight instruction at Hammondsport, New York, but the winters there made it impossible to fly year-round. Word of North Island’s ideal climate and isolated location thus attracted Curtiss. This very early aerial view of North Island was taken circa 1914. The Spanish Bight separating the island from Coronado is very evident. In addition to the climate, this sheltered body of water was one of the lures for Curtiss as it provided an ideal location for testing his experimental hydro-planes. In early 1911, Harry Harkness, a wealthy New York businessman, formed the Aero Club of San Diego and sponsored an aviation venture with Curtiss. Together they signed a three-year lease agreement, at no cost, with the Coronado Beach Company for the use of North Island. Harry Harkness purchased three French built Antoinette monoplanes to jump start the new San Diego Aero club. This unique photo was taken by Waldo Waterman just after the arrival of Glenn Curtiss on the island and shows two of Harkness’ planes along with several early Curtiss pushers. When the Curtiss Aviation Camp began operations, the only substantial building available for him was an old hay barn which he used as a hangar and workshop. Most of the other “buildings” used by the mechanics and students were “tents”. In this photo Glenn Curtiss sits in the pilot’s seat of one of his planes in front of that barn. Curtiss, hoping to interest the War Department in the possibilities aviation presented, offered free instruction in his first class for Army and Navy officers. The Army sent three candidates and the Navy sent one. Seen here are from the left, Lt. Theodore Ellyson; navy, Capt. Paul Beck, army; Glenn Curtiss; Lt. G. E. Kelly, army; and Lt. John C. Walker, army. Theodore Gordon Ellyson became Naval Aviator #1. Not only was he the first naval officer to undergo flight training, he was also the first Naval officer to make a night flight. He made the first successful launching of an airplane by catapult, assisted in preparing for the test of the first successful hydroaeroplane flight, tested the Navy’s first flying boat -the C-1, and was the first naval officer to be enshrined in the National Aviation Hall of Fame. On November 14, 1910 in a Curtiss landplane, Eugene Ely (member of the Curtiss Exhibition Team) was the first to takeoff from a ship. On January 18, 1911 Ely made the world’s first landing on a ship, the battleship USS Pennsylvania and on that same day, he made the second takeoff from a ship. On January 26, 1911, Glenn Curtiss made the first seaplane flight at North Island in his “hydroaeroplane.” After this historic flight, Curtiss intensified his efforts to convince the Navy to purchase his design. Curtiss was determined to prove that seaplanes could operate effectively with the fleet. On February 17, 1911, Curtiss demonstrated his Model D-III from San Diego Bay and landed alongside the USS Pennsylvania. He was lifted aboard by a standard boat crane and placed on deck. This demonstration, along with Ely’s, was instrumental in showing the Navy the feasibility of operating aircraft in the fleet. Soon afterward the Navy announced the first purchase of a Navy aircraft. On January 15, 1912, Ellyson set up the first aviation squadron on the northeast side of North Island consisting of tents for personnel and three aircraft (two Curtiss aircraft and one of the Wright Brothers’ design). Within four months, all aircraft had been wrecked, earning the camp the nickname, “Camp Trouble”. The squadron operated alongside the Curtiss school until May 2, 1912, when the detachment was transferred to Annapolis, Maryland. The Navy would not return again until 1917. In the meantime the Army stepped in. When the Navy returned to North Island, a decision was made by the Army and Navy that operations on the island needed to be separated. A compromise was reached that allowed the Navy to take over the northeast corner of the island while the Army relocated to the southeast end. All landplane flying operations took place on the western half of the island. Almost immediately, the Navy began to plan and build permanent buildings, while the Army continued to operate out of temporary wooden structures. This composite aerial photograph of the north end of the island was taken on December 5, 1918. Construction of the new Navy building has begun, with the new lighter-than-air building visible in the center. The earliest navy buildings on the island were of similar construction to the simple wood structures already in use by the army. Made in some cases with wood salvaged from dismantled army buildings, these facilities were intended for use only until permanent buildings were made ready. This June 1918 view shows a new enlisted barracks nearing completion. During the First World War, airships played a vital role as spotters and patrol craft. After the war, the Navy continued to show great interest in lighter-than-air technology and North Island was looked upon as an optional site for dirigible activities. In this February 3, 1919 photograph, the construction of a dirigible hanger over 250 feet long is near completion. Once completed, this hanger could accommodate all but the largest airships then in service and was the largest building on North Island. The Curtiss N-9 was one of the Navy’s most important early training aircraft. Over 560 Curtiss N-9 trainers were built, mostly under license by the Burgess Company. This World War I type, while very similar to the famous JN Jenny, was designed from the outset as a seaplane trainer for the Navy. Seen floating peacefully on San Diego Bay with a battleship at anchor in the background is Burgess-built N-9 assigned to the base reserve unit. Naval aviation activity in San Diego accelerated rapidly after WWI as squadrons of Battle Fleet aircraft concentrated their training on North Island. On September 25, 1917 Lt. Earl Spencer, U.S. Navy, was ordered to report to San Diego in order to establish a permanent naval air station for training purposes. On November 8, 1917, Lieutenant Spencer became the commanding officer of the naval air station on North Island. Spencer remained in command until December 1919. This is an artistic view of the plan for the final configuration of NAS San Diego dating from August 1919. While most of the permanent buildings shown were finished and the configuration would remain unchanged, only one of the three planned lighter-than-air hangars would be built. The Navy’s first phase of construction at North Island included the tower of the administration building and two seaplane hangars on the water’s edge of Spanish Bight. This photograph shows the newly completed administration building taken c. 1925. Although there is a new control tower today, this distinctive building remains in use. Taken c. 1925, this image of North Island has been marked to show the borders between the Army and Navy areas of operation. Over the next five years, the flying fields would be developed further. North Island was the scene of many of the Navy’s experiments with lighter-than-air. On October 10, 1924, the navy’s first rigid airship, the giant USS Shenandoah, paid a visit to San Diego after its transcontinental flight from Lakehurst, New Jersey. Advancements in aircraft and tactics highlighted the 1920s and the carrier became an integral part of fleet operations. In 1919, the US Congress appropriated funds to convert the collier, Jupiter to the first US carrier, USS Langley. By the end of the decade, two carriers were added to the fleet, the USS Lexington and USS Saratoga (both converted from battle cruiser hulls). The USS Langley, CV-1, was commissioned on March 20, 1922 and became America’s first carrier. A new era for naval aviation began with the arrival of the Langley in San Diego on November 29, 1924. The Langley is seen here on Navy Day 1929 at her dock at NAS North Island. Among the planes visible on her deck are a UO-1 and a Martin T4M-1 from the torpedo squadron VT-1B. The latter perhaps visiting from the USS Lexington, as the Langley did not carry a torpedo squadron at the time. A Vought VE-7 was the first plane to take off from the USS Langley on October 17, 1921. Seen in this image is a group of proud Navy mechanics smiling for the camera behind a Vought VE-7 in the early 1920s at NAS San Diego. Admiral Joseph Mason Reeves was instrumental in the development of carrier aviation. At the age of 53, Reeves qualified as a naval aviator observer and became the first officer wearing wings to be promoted to flag rank. In October 1925, Reeves assumed command of the Aircraft Squadron, Battle Fleet assigned to Langley. At the time, the carrier was classified as an experimental ship and was the only aircraft carrier in the Navy. Under his command, he introduced concepts of efficiency that transformed carrier tactics and doctrine. The Navy’s first aerial demonstration team was formed in 1927, the true forefathers of today’s famous Blue Angels. Commander D.W. Tomlinson formed the Three Seahawks from North Island with the support of Admiral Reeves. This panorama photograph was taken in Los Angeles in September 1928, just prior to the National Air Races. NAS San Diego was the primary home for the West Coast naval aviation in the interwar years. Under the direction of Admiral Reeves, the base was aggressively involved in every available opportunity to get public attention and advance naval aviation in the public view. The Langley anchored off Manhattan Beach near the race site, and naval officials watched the flying from her deck. Standing in the center of the pilots is Rear Admiral Reeves. Also present is Commander D.W. Tomlinson, whose personal Curtiss Jenny appears on the left. Lt. Alfred M. Pride made the Navy’s first rotary-wing landings and takeoffs with the XOP-1 while aboard the USS Langley underway in September 1931. After a short testing phase in the 1930s, Pitcairn autogiros were ruled out for Navy service. The USS Ranger and USS Langley, share the pier at NAS San Diego in 1937. The Ranger was the fourth aircraft carrier to see service and the first carrier to be built from the keel up as a carrier. Launched in 1934, she was home ported in San Diego until 1939. The USS Langley, having outlived her usefulness as an aircraft carrier, was modified into a seaplane tender and later sunk by the Japanese in the Indian Ocean, February 1942. Six Consolidated P2Y-1 seaplanes of Patrol Squadron 10, under the command of Lt. Commander K. McGinnis, are seen over Point Loma after leaving their North Island base for San Francisco in early January 1934. On January 10, they flew nonstop from San Francisco to Pearl Harbor, Hawaii – 2,399 miles in 24 hours 56 minutes, faster than any previous passage and a record for a formation of C-class flying boats. With the development of the Catalina, the Navy flew many long-distance formation flights. Competition for their share of the War Department’s budget meant getting the attention of the American public. This photograph shows VP-11F preparing for such a flight from NAS San Diego to Fleet Air Base Coco Solo in the Panama Canal Zone in December 1938. Seen here, NAS San Diego’s busy seaplane ramp is dominated by various models of early PBY Catalina flying boats in 1938. With the preservation of neutrality a major goal at the time, the navy had more PBY patrol planes in service than any other type. Visible in the photograph are aircraft from at least three squadrons. By 1939, North Island was beginning to take on a different shape. Constant dredging of the bottom had added over 50 acres of land to the north and west sides. New seaplane ramps and hangers were built on the northern shoreline to accommodate the growing fleet of PBY patrol planes. NRSL was established in 1940 to improve communications on ships operating at sea and to investigate the potential benefits of two emerging technologies: radar and sonar. Trained fighter interceptor pilots at North Island used the first operational radar set. NRSL later became the Navy Electronics Laboratory (NEL).